Beer Advocate, Dogfish Head Craft Brewed Ales, Recipe, Short's Brewing Co.
Oaxacan cuisine abounds with chilies, chocolate and many other wonderful flavors. This beer brine recipe takes advantage of a Brown Ale’s melanoidin-rich malt bill to enhance the flavors from this Mexican region culinary treasure. 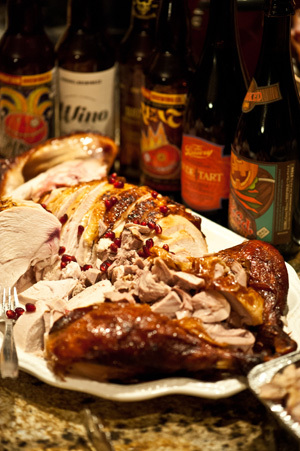 This beer brine will season the bird from the inside out, layering it with chilies, onions, citrus and a wonderful malt elegance, creating a very special centerpiece on your Thanksgiving table. 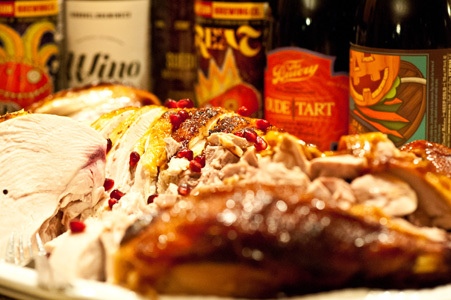 This beer brine can be used with other poultry, such as chickens, Cornish game hens, guinea fowl and others. Have turkey bones? Make the best Turkey Stock with this recipe. Infusing the regional flavors of the Mexican state of Oaxaca into a beer brine, made for turkey, chicken Cornish game hens and other poultry | fowl. In a large stockpot over medium high heat, add the olive oil, leeks and carrots. Sauté the mixture, stirring frequently, as the brine will become bitter if they burn. After 10 minutes add the chilies, garlic, bay leaves and oregano, sautéing for an additional 5 – 8 minutes, or until the onions caramelize to a dark brown color. Turn down the heat to medium and add the brown sugar, stirring to combine for another 2 – 3 minutes. 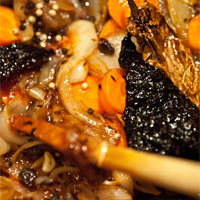 The sugar will help the vegetables caramelize. Deglaze the pot with the tangerines (squeezing their juice into the vegetables, then add the rind), stir for a minute, then add a quart of water. Stir in the salt and pepper and bring the brine to a boil. 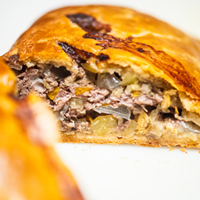 Cook for 5 minutes to allow the flavors to infuse. Turn off the heat and let the mixture cool for 30 minutes. 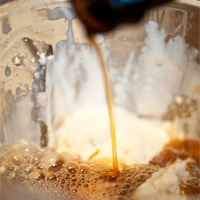 Next, add the ice or cold water, stirring to further cool the mixture. Lastly, add the Brown Ale. Waiting until the end to add the beer will prevent the heat from changing its flavor profile. 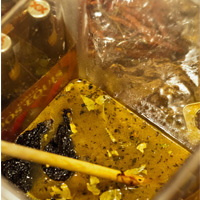 Mix to combine all the ingredients and measure the brine’s temperature. To be safe to use, a thermometer should read 40°F | 4°C or lower. If it is warmer, refrigerate until it reaches 40°F | 4°C. Take the fresh turkey out of its package. 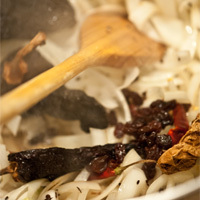 Remove the neck, gizzards and liver, setting aside for use in a stock or gravy. Rinse the bird under cold water, turning it a few times to wash any blood from the cavity and under the neck flap. Pluck any remaining quills. Lightly dry the turkey with paper towels. If you have room in a refrigerator or kegerator, ready a Cambro 22 qt Polypropylene Food Storage Container , large stockpot or a Ziploc XL HD Big Bag . 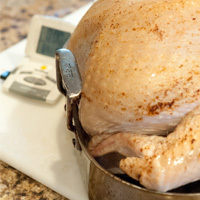 Place the turkey into your container of choice and top off with the chilled brine, submerging the turkey completely. Then place in the cold space. If cold space is limited, use a large cooler cleaned with a bleach/water solution or use a Ziploc XL HD Big Bag . Place the turkey in the cooler or bag and cover with the brine. 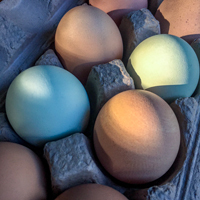 Use one-gallon sealable bags filled with ice to keep the bird ice cold without diluting the salinity or flavor of the brine. 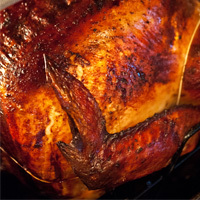 Brine the turkey for 24 (for a smaller 16 pound bird) to 48 hours (for a larger 22+ pound bird). Keep the turkey and brine cold during this time. 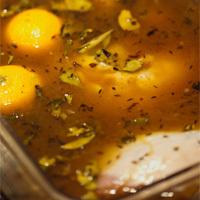 Rotate the turkey in the brine every 12 hours to allow it to evenly marinate. 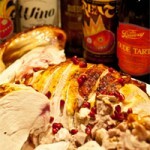 Remove the turkey from the beer brine and dry well inside and out with paper towels. This will help the finished skin become a crunchy brown. Place the turkey, breast side up, in a roasting pan fitted with a roasting rack. 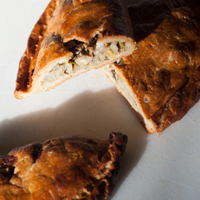 Fill the cavity with the oregano and tangerine. Tuck and fold the wings behind its back and truss the turkey with twine to help the bird cook evenly. Ideally, let the turkey sit at room temperature for 2 hours prior to roasting. A warmer turkey will cook more evenly. Discard the brine. Pre-heat the oven to 350°F | 177°C on a convection roast/bake setting if possible. I highly recommend using a temperature probe to make sure the turkey is cooked to the appropriate temperature instead of estimating a length of time by its weight. Take readings from the middle of a breast or in the thigh. Make sure the probe isn’t touching a bone, which will result in a false reading. Set the temperature alarm to 160°F | 71°C. 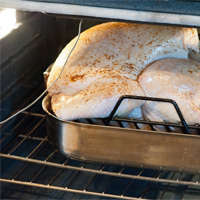 Once it’s removed from the oven, the carry-over heat will bring the bird’s final temperature to 165°F | 74°C, eliminating any salmonella risk. Remove the turkey from the oven, cover with aluminum foil and let rest at room temperature for 20 – 30 minutes before carving. This will help re-distribute the juices, keeping the turkey moist. 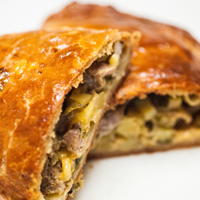 With the Latin flavors in this recipe, the leftover turkey meat can become a wonderful ingredient for many other dishes such as tamales, enchiladas, tacos, burritos and moles. The beer pairing options for this style of bird and side flavors leans towards Mexican style lagers, such as Vienna Lagers, Bocks, Märzen | Oktoberfest, and other malt forward, melanoidin rich ales like American Brown Ale, English Brown Ales or a Belgian Dubbel.